Edits not manually or automatically marked as patrolled. Edits manually marked as patrolled. Edits by advanced users whose work is automatically marked as patrolled. jmatazzoni moved this task from Untriaged to Product/Design Work on the Collaboration-Team-Triage (Collab-Team-This-Quarter) board. I took a stab at proposing language for this new feature, as well as showing how these should be arranged within the Review Status filters. Regarding the latter, James suggests leading with Unpatrolled because it will be the most commonly used. If it's not possible to put it first for some reason, then put it last after manual and then auto. It's rather hard to write a description of this slightly arcane function. I've provided four options. #s 1 and 2 probably won't wrap, but IMHO they are not very clear. E.g., saying something "doesn't need patrolling" leaves slightly ambiguous the question of whether, from the POV of the Unpatrolled filter, it is or is not patrolled. I don't recommend either of these and really only put them here to show how tricky this is. #s 3 and 4 will probably wrap in English. #3 might fit and is reasonably clear. #4 is more clear, so if we're going to two lines anyway, why not be more clear? Opinions? Alternate ideas? Edits by advanced users who have the "autopatrol" right. Edits by advanced users whose edits don't need patrolling. Edits by advanced users and so automatically marked as patrolled. jmatazzoni moved this task from Product/Design Work to Ready for Pickup on the Collaboration-Team-Triage (Collab-Team-This-Quarter) board. yes, I think that's right. I'll put that into the product description and move this out of the Product/Design column to RFP. I wrote this on the plane without having seen the discussion about language here, so I made up my own. I'll amend to put in the right language tomorrow. @Catrope, please say when it will be deployed, so we can announce it in Tech News before it happens. As a reminder, publication limit os on Thursday (or early PDT Friday) for a distribution on Monday/Tuesday (depending on timezones). Most likely it'll be on next week's train (April 10-12). Thanks for making the change. I'm sad though not surprised that the Autopatrolled line wraps, but I think clarity trumps brevity in such a circumstance. It may wrap in other languages. That's not overall a big deal. Noted, thanks! I've added it to Tech News. @Catrope, @jmatazzoni recentchanges table has only three options for patrol status: 0, 1, and 2 which you mapped to 'Unpatrolled', 'Manually patrolled', and 'Autopatrolled' respectively. Unfortunately, actions like log entries are marked with 1 which make them displayed as 'Manually patrolled'. Ideally, it'd be good to have a fourth category - "unpatrollable", but at very least they should be 'Autopatrolled'? Hmm, we could change such actions to get rc_patrolled=2 instead of rc_patrolled=1 by default, or we could use 3 for unpatrollable. @Ladsgroup: thoughts? 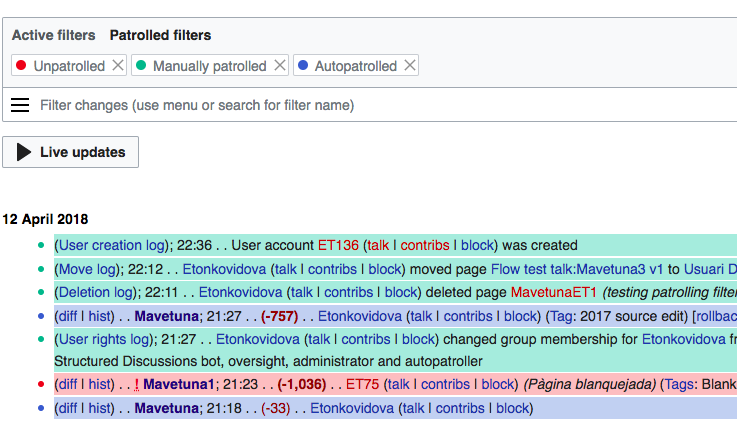 Checked in cawiki betalabs - rollbacks, undo, log entries and Category changes are marked as Autopatrolled now.